The Chateau d'If as seen from Notre Dame de la Garde, in Marseille on the Cote Bleue, Provence in France, Europe. 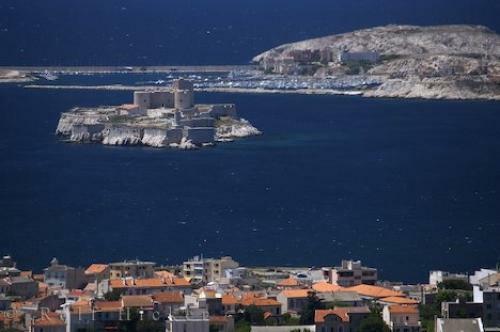 Photo of Chateau d'If in the Bay of Marseille in Provence, France in Europe. ... Another poor soul, a Monsieur de Niozelles spent six years of solitary confinement for not removing his hat to Louis XlV. It is ironic that 'If' is French for 'yew' which is a tree often associated with death.Chateau d'If in the Bay of Marseille seen from the Notre Dame de la Garde, ND de la Garde in the city of Marseille, Bouches du Rhone, Cote Bleue, Blue Coast, Mediterranean, Provence, France, Europe. I photographed this photo with the digital SLR camera model Canon EOS-1Ds Mark II, aperture of f/6.3, exposure time of 1/500 sec. on ISO 100, as always I used a original Canon Lens, the focus lenght for this picture was 320mm.